A writer by the name of Charles Swindoll has this to say about attitude: "The longer I live, the more I realize the impact of attitude on life. Attitude, to me, is more important than facts. It is more important than the past, than education, than money, than circumstances, than failures, than successes, than what other people think or say or do. It is more important than appearance, giftedness, or skill. It will make or break a company, a church, a home. The remarkable thing is we have a choice everyday regarding the attitude we will embrace for that day. We cannot change our past. We cannot change the fact that people will act in a certain way. We cannot change the inevitable. The only thing we can do is play on the one string we have, and that is our attitude. I am convinced that life is 10 percent what happens to me and 90% how I react to it. And so it is with you. We are in charge of our attitudes." I don’t know how old this writer was when he came to the conclusions he shares about attitude, but I don’t think he was only eight years old. That’s the age of a young lady I recently had the privilege to meet. Her name is Kelsey. She is a student at A.H. Roberts here in Livingston, and is probably best known for her attitude. She is a positive thinker, a girl who is always upbeat and smiling despite the fact that she started life with all the cards stacked against her. Kelsey just celebrated her 9th birthday this Friday, May 13th. But on May 13, 1996, the day she was born, doctors at Vanderbilt were preparing her family for the worst. Several weeks prior to Kelsey’s birth, her family became aware that the expected baby would not come into the world as a healthy little girl. Ultrasound tests done in Livingston and later at Vanderbilt in Nashville revealed that Kelsey would be among those who suffer from a condition called spina bifida, and as a result would be born with fluid on the brain and an open spine. She was delivered by C-section that day, and all that had been feared was true, plus Kelsey was also afflicted with club feet. The doctors told Kelsey’s parents and other family members present the day she was born that more than likely, she would not live through the night. Most babies born with spina bifida have a very low survival rate. But the doctors could not have known that a bright little spirit glowed from within this tiny child, a spirit that was determined to beat the odds, and she has. Although Kelsey is just reaching her 9th birthday, she has already endured seven surgeries, one of which was to correct her club feet which are perfectly straight now. The next day after birth, two surgeries were performed, one for a shunt to drain the fluid from her brain, another to close the spine. Even though the doctors predicted this baby would not survive even one night, Kelsey came home after only 11 days in the hospital. But the road to improvement for Kelsey was a long and rocky one. Problems with her breathing developed requiring her to be placed on oxygen twenty-four hours per day, and for the next four years, Kelsey’s Nana, Debbie Bilbrey, was her primary caregiver. Kelsey’s mother, Dawn, got a job at KMA in order that she could support herself and the new baby. For three years, Kelsey participated in an intervention services program offered through Tennessee Tech that included speech and physical therapy. At age three, she enrolled with the Special Needs class at A.H. Roberts, even though she continued to be on oxygen 24 hours a day and sat in a wheelchair. Slowly her breathing problems lessen, and gradually she was able to be taken off the use of oxygen. 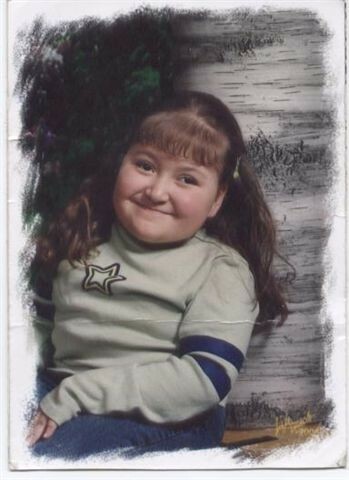 Kelsey is considered to be a very special little girl by all her family and rather large extended family members. Her parents are Jimmy and Dawn Walker. She is very close to both sets of grandparents, Danny and Debbie Bilbrey, W.T. and Vonda Wilson and to her little sister Tiffany. She has other close relatives she loves dearly, but due to fear of overlooking a name, we won’t be able to list them all. Kelsey attends church at the Hilham Church of God, and is a strong believer in prayer. She never begins a meal without first saying a blessing. If she hears about anyone who might be sick or undergoing health problems, that person is included in her daily prayers. Her concern for the war in Iraq is shown through her prayers for the safekeeping of our soldiers. Kelsey’s Nana, Debbie Bilbrey, had this to say about why she thinks Kelsey came into their lives: "God only gives special children to special people to take care of." I would say that’s a good indication of where part of Kelsey’s attitude comes from. In fact, Debbie had some words by Helen Steiner Rice written down for me that she finds are very fitting of this situation and she finds comfort in reading. "Nothing is ever too hard to do if your faith is strong and your purpose is true, So never give up and never stop, Just journey on to the mountaintop." The next time you shop at Dollar General Store on East Main Street, say hello to Debbie. If you don’t know who she is, she’s the one with the picture of Kelsey on her name tag. Just mention Kelsey’s name and it won’t take but a second to see where that bright smile of Kelsey’s comes from. I think Charles Swindoll would be more than pleased to use both Kelsey and her Nana as perfect examples of those having a wonderful attitude despite circumstances that others might find extremely difficult to deal with. Thank you Debbie and Kelsey for sharing this story, and here’s hoping Kelsey's ninth birthday was the happiest ever for such a remarkable little girl.